At the dawn of the new season, Chesterfield FC broke the news of the retirement of the #14 shirt, last worn with distinction by Jack Lester. This is very much something associated more with the razzmatazz of sport in the United States, where football teams usually contain dozens of players and no-one bats an eyelid at a guy running out in the number 93, or whatever. Over here we have not long since moved away from numbering our players 1 to 11, and to retire a number seems like wanton extravagance. You've normally got to have suffered some dreadful mishap to have your shirt retired and, while leaving Chesterfield is a thing to be sad about, it is hardly the same as having your number posthumously retired, which is an honour, if you want to look at it that way, bestowed on a good 75% of those whose shirts have been pickled in aspic. I can find eight players in senior English football who have had their squad numbers retired since the things were first introduced. West Ham's Bobby Moore had retired as a player long before his untimely death prompted West Ham to retire his number, and the others - Michael Maidens (Hartlepool,) Ray Jones (QPR,) Dale Roberts (Rushden,) Adam Stansfield (Exeter,) Mark Philo (Wycombe,) Richard Butcher (Macclesfield) and Marc-Vivien Foe (Manchester City) all earned the honour in the most terrible fashion. So Jack's honour is, it appears, unique in senior English football, and well done to the club for that. I can't help feeling that it is a bit OTT, though. You don't have to have a PhD in Chesterfield football history to come up with a "one to eleven" of Chesterfield players who arguably, deserved the honour just as highly, if not more: Moss, Cookson, Randall, George Smith, Banks, Holmes, Hewitt, Blakey, Clarke, Sears, Smallwood - there's eleven deserving cases that came to mind as quickly as it took to type their names. Being careful to get this the right way round, Johann Cruyff now joins Jack Lester in having the #14 retired in their honour. Tarik El-Taib (Al Ahly, Tripoli) and Temuri Ketsbaia (Anorthosis Famagusta) have also had their 14 retired, and lived to tell the tale. Who else might we have retired in for, at Chesterfield? Shane Nicholson wore it before Jack to stroke home all those penalties; Cup run hero Chris Beaumont was the first to wear 14. Martyn Booty and Chris Brandon can also legitimately claim that the club have retired their old squad number! Every day that I think about Jack I'll be grateful that I saw him in the number 14, but I'm not sure we should have retired the shirt. It might be clever on the club's part, since it absolves anyone of the responsibility of having to fill it, but I'd like to have seen a young, hungry player come in and demand the #14, determined to prove himself worthy of it. When my friend and fellow history buff Peter Whiteley emailed me to say that he had been handed the Derbyshire Times Hospital Junior Cup Competition trophy and wondered what to do with it, a bell rang. "Hold on to it," I said, "since you might have been handed something we've actually won before." And so it proves. 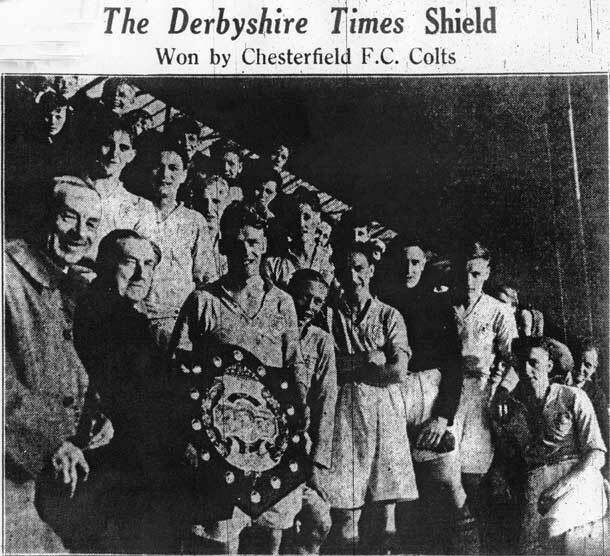 Despite the trophy's name, its shape led to it being more popularly known as the "Derbyshire Times Shield," and the photo below shows the victorious Chesterfield Colts team of 1946-7 being presented with the shield after beating Hardwick FC 6-1 on June 9th, at the end of a season extended by a savage winter. In the newspaper photo above George Langton, the Chesterfield skipper, holds the shield while his team-mates look on. The photo caption says we played a "Colts" team (our 4th XI) but the line-up was more typical of a 3rd XI "A" team game. 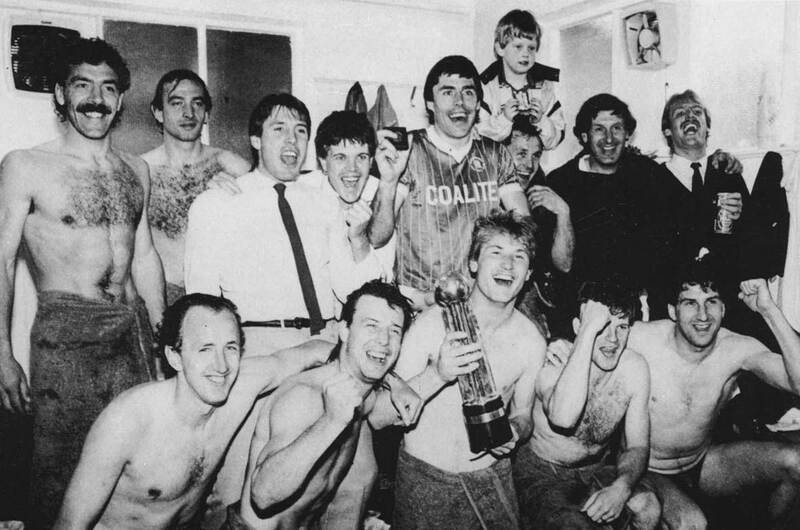 Of particular interest to us are the youthful features of Dave Blakey, over to the right, who was making just his second appearance for any Chesterfield team and was just a few weeks into a career that lasted twenty years. We know the names of nine of the players: George Thompson, the goalkeeper, came from Huddersfield and made no impression on our first team, but enjoyed a decent career with Scunthorpe and others. Langton had come from Butterley Welfare in the previous season, and Blakey had just joined from East Chevington Juniors, in Northumberland. Fellow halfbacks Len Hobson and J Dennison came from Swallownest Juniors and Shirebrook respectively, and the forward line included John Allison, who had come down from Northumberland with Blakey; Jimmy Wilson, a local boy from the Derby road Methodists team; Albert Rusk, who had come from Portadown the previous season and the "Roberts" who played outside-left was most likely Harold, who played for the "A" team despite having completed 36 first-team games in 46-7. A new entry to the "team" stats deserves a bit of explanation. "How seasons unfolded" displays the side's highest and lowest league positions during a season, and shows whether the highest pre-dated the lowest, or vice-versa. Other columns show the side's league position after ten games, and with ten games to go, beside the finishing position. The last columns were added in response to the idea that Chesterfield always start brightly and run out of steam with the finishing post in sight. The amateur football historian in me is uncomfortable at seeing the word "always" in any such claim, so I thought I might be able to establish that the idea was simply an understandably gloomy but undeserved assessment. So, are we "chokers?" We've improved our league position over the last ten games in 27 out of the 85 Football League seasons since 1921-2, whereas we've contrived to worsen it in 35 of those seasons. In all the rest - 23 of them - we've finished in the same position that we held with ten games to go. As is usually the case with Chesterfield FC, then, the evidence is inconclusive, and can probably be shaped to fit any point of view. The first ten full seasons of this century saw us contrive to worsen our league position over the last ten games on nine occasions, which slants the figures slightly towards the fatalistic view. What might be recorded is the fact that our improvement over the last ten games last season - from 14th place to 8th - equalled our record last-ten improvement. We had previously improved by six places only once, when we climbed from 20th to 14th in 1975-6. Our drop from 8th with ten to go, to finish in 16th place in 2005-6, remains our greatest margin of collapse. The update is coming along nicely. New to the lists is one that catalogues all the players who have scored both for us and against us in competitive football. That number currently stands at 108, I think, and includes 25 players who have scored against us for a side, and for us against the same side. The most recent of those is Marc Richards, who scored for and against us and Port Vale. The list doesn't include own goals; these are (now, I believe, fully) documented on another list. It's not everyone who has ever scored for us or against us, but rather, it's a list of folk who have scored for us and against us. I hope that is clear! A few have accoplished this feat in the same season but only two - Reg Halton and Phil Bonnyman - share the distinction of having scored for us and against us in matches involving the same opponenents in the same season. Reg scored against us for Bury in 1948-9, was transferred to Chesterfield, then scored for us against The Shakers in the return game. Phil Bonnyman accomplished the same feat in the same manner against Carlisle United in 1979-80. Compilation of his list would not have been possible without the English National Football Archive. Can I play you every week? One of my latest doomed-to-be-half-finished projects on the facts and figures front is a list of every opponent who has scored a hat-trick or more against us. Some time soon I'll get up to make a cup of tea, or something, and forget that I started it. Or I might get sidetracked by people like this chap, Bert Whitehurst, the Rochdale forward from the 1920s. Why him, particularly? Using the lovely English National football Archive site I recorded Whitehurst getting five against us in December 1926. The site will present a player's record over a season to you, and I noticed he got a couple more in the return match. Seven in a season against the same side is some going. 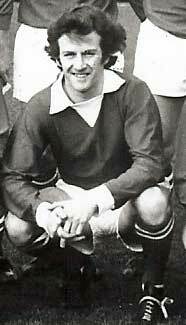 Bert got four against us at Spotland the following season, and another two at Saltergate in the return, meaning that he netted no fewer than thirteen goals against us in four consecutive games. Looking further back I saw a goal for Dale against us in each of the 1923-4 and 1924-5 seasons, and another for Bradford City against us in 1928-9. After that we avoided him for several seasons, and our last encounter with Whitehurst was when he was a Tranmere player, in 1933-4. He failed to score in what became his last-ever senior appearance in English football. 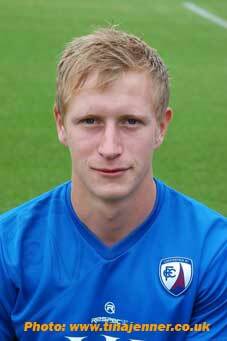 In all, then, Whitehurst netted sixteen times against Chesterfield in the football League. His career saw a return of 182 Football League goals from 313 games, so something getting on for 10% of all his goals were stuffed into a Spireite onion bag. So, is this a record? Can you think of anyone else who might have scored this many against us in his career?